The recent 17th International Commercial High School English Speech Contest in Tokyo was won by Choan Matayoshi, in the 11th grade at the Okinawa Prefecture Urasoe Commercial High School, Tourism department. Since the start of this English Speech Contest, nobody has ever won the contest two consecutive years in a row, but I am very proud to announce that Choan Matayoshi is the first ever to achieve this feat. Parents! Have you told your children how much you care and love them lately? Students! When were the last time you told your parents, “Thank you” for all they have done for you? If you haven’t lately, then you will be surprised about the strong bond Choan has with her parents. In the speech contest, she discussed her growth and understanding. No one can ever imagine how much she has struggled to adjust to her new environment, new school, and a new language. There was a time when Choan and her parents had lived apart for three years because of her parents’ work in Japan. When she met with her parents, she didn’t even recognize her own father’s face, because it was such a long time since she had seen her father. So they decided to live together as a family once again. Bullying which happens in any school is especially difficult for foreign or mixed blood children in Japanese schools. 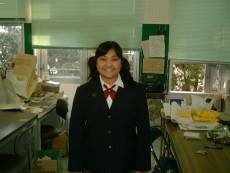 When Choan came to Japan, she was only eight years old. Soon she became a victim of being bullied by some inconsiderate students. Eventually Chan’s parents found out that some students were bullying their daughter at school; they felt terrible for her. At that period of time, she had some doubt if her parents really cared about her inside her little heart. Once they found it out, all they could say was that they were sorry. Hearing that from her parents made a big difference in her life. The love they have for each melted away any doubt or anger, and brought them closer together as a family. Honesty made her believe, and forgive her parents. Trust also made her stronger psychologically. She concludes, “ Without my parents support I couldn’t have adjusted so easily to a new environment, a new school, and a new language. I can honestly say that they are the most honorable parents alive. I’m also very proud to be their child.” When Choan talks about her future, her eyes are brilliantly lit up with excitement and then she starts to talk immediately about her parents. At the final stage, the judge commented as follows, "I have the confidence that there is nothing to worry about in the future. All the candidates will help the world to come closer having more knowledge by obtaining communication skills, and understanding each other. Be confident! And keep on learning English."